Drone technology has illustrated itself as particularly useful to the study of cetacean in the GEMM Lab (see previous post by Dawn and Leila) and in the marine mammal research community in general. The last Conference on the Biology of Marine Mammals in Halifax staged several talks and posters describing the great potential of drones for observing animal behaviors, collecting blow samples, estimating the size and health of animals, or estimating densities. The GEMM Lab has been conducting leading research in this field, from capturing exceptional footages of lunge feeding blue whales in New Zealand, to measuring gray whale health on the Oregon coast. 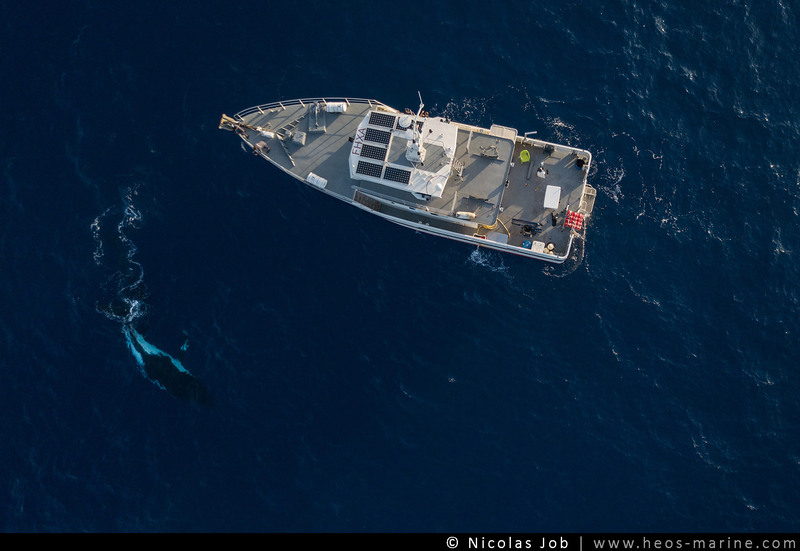 In September 2017 I participated in a scientific cruise undertaken by Opération Cétacés /IRD to study New Caledonian humpback whales, and we were lucky to be joined by Nicolas Job, a professional diver, photographer and drone pilot. It was one of those last minute decisions: one of our crewmates canceled the week before the survey and we thought “who could we bring on instead?”. We barely knew the man but figured it would be good to get a few humpback whale drone images… We invited him to join us on the research expedition only a few days before the trip but this is not the kind of opportunity that a photographer would pass on! Far from trying to acquire scientific data in the way the GEMM Lab does with blue whales and gray whales, we were only hoping to take “pretty pictures”… we were not disappointed. Once we got past a few unexpected issues (YES you need to wear gloves to protect your fingers when trying to catch a flying drone (Fig 1), and NO frigate birds will not attack drones as long as they don’t smell like fish), Nicolas managed to fly the drone above our small research boat and capture footage of several humpback whale groups, including mothers with calf and competitive groups. Figure 1: Frigate birds are known to attack birds in flight to steal their meal straight from their beak…luckily they did not attack our drone! 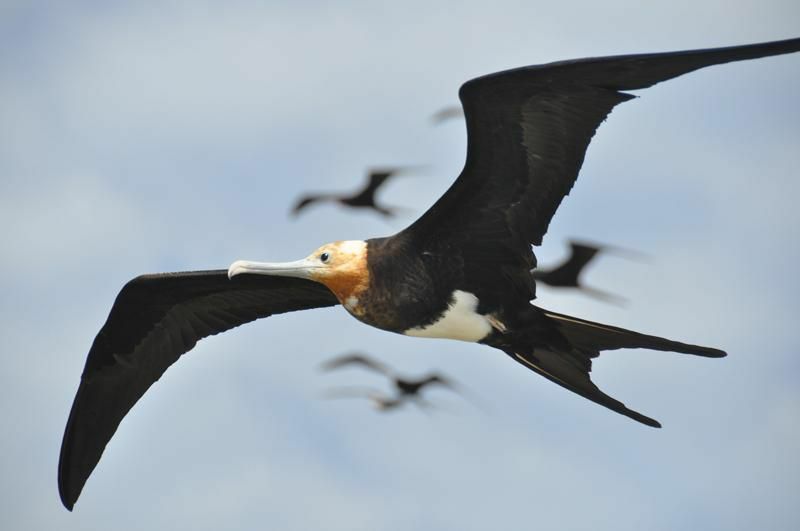 On the contrary, it seems like they could help scientists one day as it has been suggested that UAV builders could learn from their exceptional soaring behavior that allows months-long transoceanic flights (photo credit: Henri Zemerskirch CEBC CNRS) . As I said, no groundbreaking science here, but this experience convinced me that drones can bring a new perspective to the way we observe and interpret animal behavior. As a known statistics/R-lover in the lab, I often get so excited by the intricacies of data analysis that I forget I am studying these giant, elegant, agile, and intelligent sea creatures (Fig 2). And the video clips that Nicolas put together just reminded me of that. The clear waters of the Natural Park of the Coral Sea allowed us to see whales as far as 30 meters deep in some areas! This perspective turned our usual surface observations into 3D. We could see escorts guarding maternal females and preventing other males from approaching by producing bubble trails. Escorts also extended their pectoral fins on either side of their body, a behavior supposed to make them look more imposing in the presence of a challenger. Competitive groups were also very impressive from above. During the breeding season, competitive groups form when several males aggregate around a female and compete for it. These groups typically travel at high speed and are characterized by active surface behaviors such as tail slaps, head lunges, and bubble trails. Figure 2: This female humpback whale was encountered in 2016 and 2017. Her white flanks make her particularly easy to recognize. On both occasions it put on a show and kept circling the Amborella oceanographic vessel for more than an hour. To provide a sense of scale, the vessel on this drone footage is 24 m long (photo credit: Nicolas Job). Since the discovery of humpback whale offshore breeding areas in Antigonia seamount in 2007 and Orne bank in 2016, a lot of research has been conducted to better understand habitat preferences, distributions and connectivity in oceanic waters of New Caledonia (see previous post). Surveys have always been strongly multidisciplinary, including boat-based observation, biopsy sampling, and photo-identification, satellite tracking, in situ oceanographic measurements and acoustics. Will drones soon become an essential component of this toolbox? One potential application I could imagine for my personal research questions would be to use aerial photogrammetry to measure the size of newborn calves. Indeed, we have found that offshore seamounts are used by a relatively great number of mothers with calf (Derville, Torres & Garrigue, In Press JMAMM). This finding is counter intuitive to the paradigm that maternal females prefer sheltered, shallow and coastal waters as shown in many breeding grounds around the world. Yet, we believe unsheltered oceanic areas might become more attractive to maternal females as the calf grows bigger and more robust to harsh sea states and encounters with competitive adult males. Drone photogrammetry of calves could likely help us confirm this hypothesis. But for now, I will leave the science behind for a bit and let you enjoy the sheer beauty of this footage! Film directed by Nicolas Job (Heos Marine) with images collected during the MARACAS3 survey (Marine Mammals of the Coral Sea: IRD/ UMR Entropie/Opération Cétacés/ Gouv.nc/ WWF/ Ministère de la Transition écologique et solidaire). Next Next post: Skype a Scientist – Are you smarter than a middle schooler?